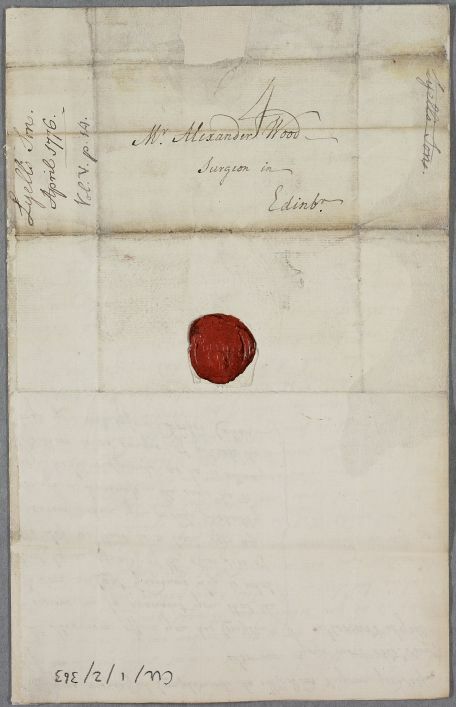 Letter from Stewart Lyell addressed to the Edinburgh surgeon Alexander Wood. 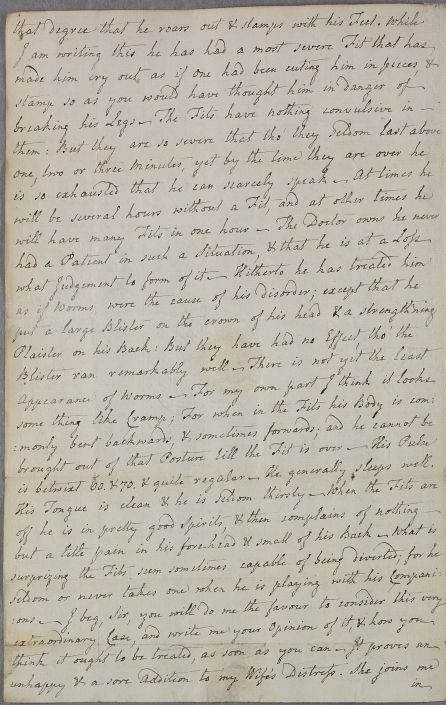 Lyell briefly mentions the case of his wife and gives a detailed account of the case of his teenage son who is having seizures. 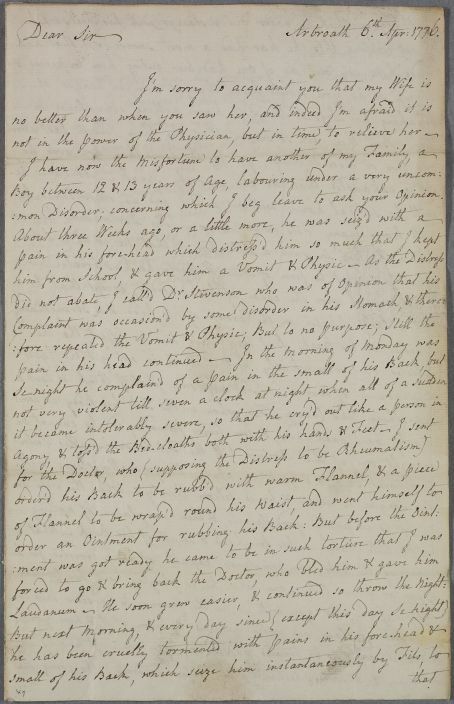 Summary Letter from Stewart Lyell addressed to the Edinburgh surgeon Alexander Wood. Lyell briefly mentions the case of his wife and gives a detailed account of the case of his teenage son who is having seizures. 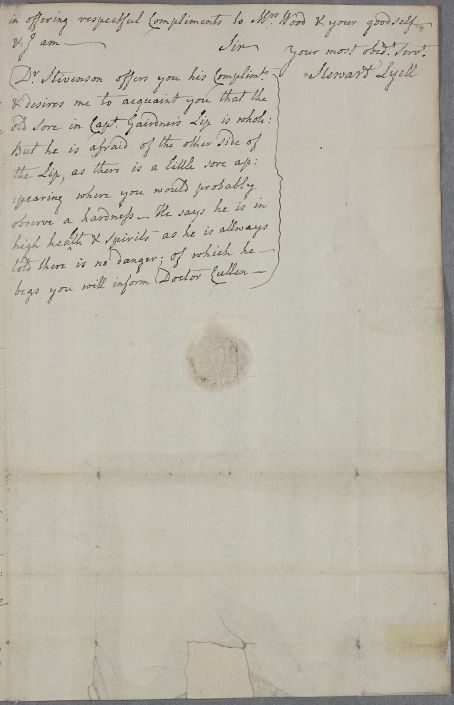 Case of Captain John Gardiner, who has an ulcerated lip. Case of the twelve year old son of Mr Lyel [Lyell] who suffers from convulsive fits. Case of Mrs Lyell, whose symptoms are not mentioned, but whose husband Stewart Lyell fears cannot be easily cured. She is very distressed since her teenage son started having seizures. mon Disorder; concerning which I beg leave to ask your Opinion. is betwixt 60. & 70. & quite regular – He generally sleeps well. 1: More commonly written 'sennight', meaning ' a week' (literally 'seven nights'). Dr. Stevenson offers you his Complimts.